Vivo recently teased the launch of the upcoming X21 smartphone at an event in China on March 19. While the company teased the presence of an under-display fingerprint sensor on the phone, other details were not specified. But, as is the case with a lot of other popular smartphone brands, a prototype of the phone has been spotted on benchmarking website Geekbench revealing several internal specifications. The listing suggests that the Vivo X21 will be the Chinese phone maker's first phone to run Android 8.1 Oreo out-of-the-box. 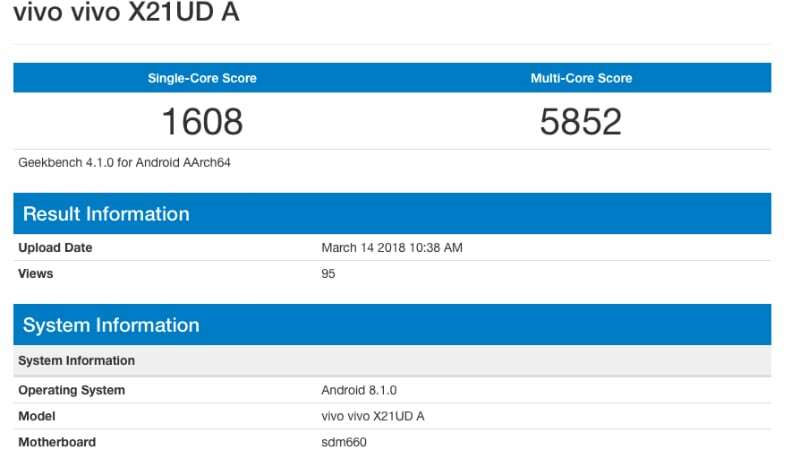 According to the Geekbench listing, the Vivo X21 will be powered by an octa-core Qualcomm Snapdragon 660 SoC, much like predecessor X20, clocked at 1.84GHz. The phone is also expected to sport up to 6GB of RAM. Apart from that, the phone has received a single-core score of 1608 and a multi-core score of 5852, which seems to be decent enough for a mid-range phone. The phone is suggested to be Vivo's second smartphone - after the X20 Plus UD - to feature an under-display fingerprint sensor, giving it a bezel-less design. And, once again, other specifications are not yet out in the open. More details are expected to get leaked/ reported in the days closer to the launch date. Separately, the Vivo V9 is slated for launch in India on March 23. With an iPhone X-like notch and vertical dual rear camera setup, the Vivo V9 has already been listed on Vivo's official e-commerce portal in the country. The upcoming phone is suggested to sport a a large 6.3-inch full-HD+ IPS display, an octa-core Qualcomm Snapdragon 626 SoC, 4GB of RAM, and 64GB inbuilt storage. There is also a 3260mAh battery backing the internals.